Next in the series on Luther's Smokehouse is this Teriyaki beef jerky. See my reviews of their Old Fashioned Original and Old Fashioned Hot. All of his jerky is made in his own USDA inspected facility. He also runs a restaurant and country store. Beef, hydrolyzed protein from soy, sugar, salt, soy sauce solids, spices, sodium phosphate 5%, carmel powder, garlic & onion, vinegar powder, sodium erythorbate, sodium nitrite. The first thing I taste from the surface of these pieces is a salty flavor followed by a light teriyaki flavor and a light sweet. The saltiness picks up quite a bit with more sucking. The chewing flavor starts with a stronger saltiness, a meat flavor, while a soy sauce flavor starts making itself known. 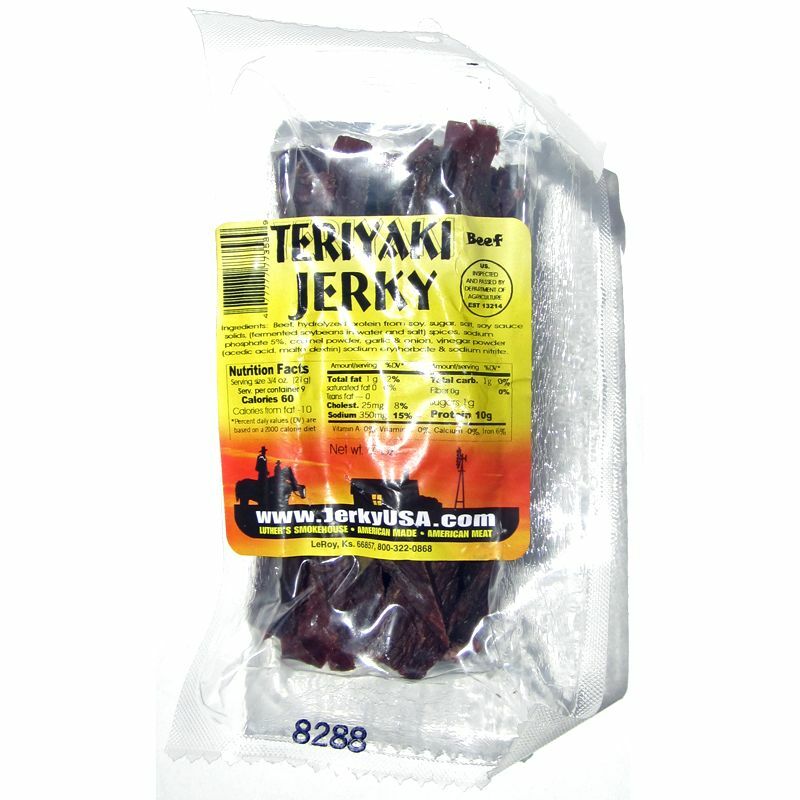 For being labeled as "Teriyaki Jerky", I can taste something of a teriyaki flavor, but not anything that really belts out a strong teriyaki flavor, and not much like what I'd expect to get from a Japanese restaurant. The teriyaki flavor in this is only lightly sweet, and I expect good teriyaki to be much sweeter than this. I also expect teriyaki to have a tangy component and I'm not getting it in this, nor any kind of pungent contrast. If anything, there's a moderate soy sauce flavor coming through, and that's really the only thing teriyaki about this. This Teriyaki variety doesn't have the natural meat flavors that the company's Old Fashioned Original and Old Fashioned Hot have. Instead, it tastes more like a cured meat flavor. I don't quite pick up that nice smokiness the previous two varieties had either. I can sense a light touch of smoke, but otherwise I think the teriyaki flavorings are masking over smoky natural meat flavors. There's a slightly higher saltiness in this than the Old Fashioned Original and Old Fashioned Hot. After eating several pieces, it seems the saltiness is what becomes the dominant flavor. It seems to have a medium-high level of taste. 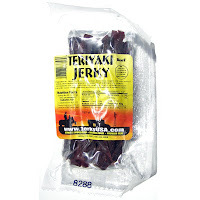 Overall, what you're going to notice in this jerky the most is something of a teriyaki flavor initially, but perhaps more closer to a soy sauce flavor with a touch of sweet. You'll pick up a more of cured meat flavor than a natural meat flavor, just a touch of smokiness. But after eating several pieces, it's the saltiness that ends up dominating this jerky. These are strips of whole meat, sliced to a medium thickness, and in lengths of ranging from three to seven inches. This is a dry jerky with a dry, though slightly sticky-oily surface feel. It has a good deal of flexibility if bent, seemingly bending to 180 degrees with minimal cracking. Biting off chunks can require some gnawing, while chewing is labored. The chewing texture starts out feeling stiff with a good deal of chewing resistance. It's starts out somewhat tough to chew, but with some labor I can get this to break down, and at that point it seems to chew much more easily. And once chewed down to a soft mass, it tends to feel steak-like, like one cooked well-done, though a tad crumbly. These strips appear to be mostly all meat, with some small streaks of fat on about half of them. I didn't see any gristle or tendon. However, the chewing revealed some unchewable wads of tissue and some stringiness. As for clean eating, it's largely clean. I find only a thin film of stickiness on my fingertips, but not enough to require a licking before touching my keyboard. 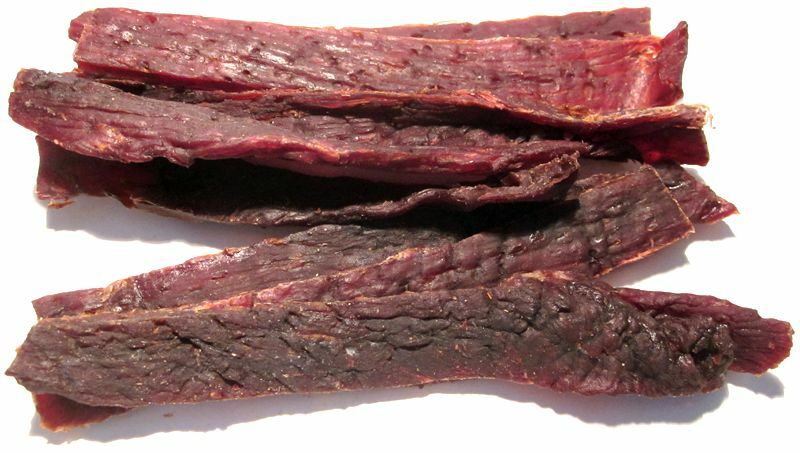 Luther's Smokehouse sells this Teriyaki Beef Jerky at a price of $8.75 for a 7oz package. If you bought two packages, the shipping comes to $8.95, for a total of $26.45. That works out to $1.89 per ounce. 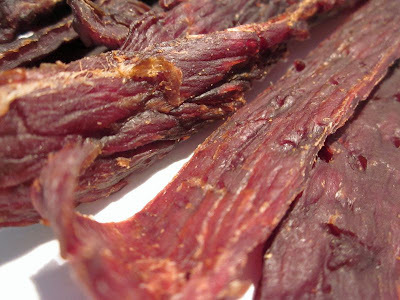 For general jerky snacking purposes, at the $1.89 per ounce price, this jerky presents a decent value. I'm getting a fair amount of snackability from its overall satisfactory flavor, though rather chewy meat consistency. That price is at or below what you'd pay at the grocery store for major brands of jerky, and it seems to provide a comparable snackability. As a Teriyaki beef jerky, at the same $1.89 per ounce price, it's a fair value. The amount and quality of teriyaki flavoring seems to be quite similar to what I get from a Jack Link's, Oberto, or other major brand, and the price is about the same as well. This Teriyaki beef jerky from Luther's Smokehouse provides a little bit of a teriyaki flavor, but mostly comes off as a moderately soy sauced jerky with a touch of sweet, and not really what I consider to be teriyaki. It's quite different from the company's Old Fashioned Original and Old Fashioned Hot varieties in that it doesn't have the same dominant smoky natural meat flavor. Instead there's something more a cured meat flavor and just a touch of smoke. After eating a few of these strips, it's the saltiness that ends up defining the dominant flavor of this jerky. The meat consistency is more comparable to the company's Old Fashioned Original, being more chewy, and requiring a decent amount of effort to eat. Their Old Fashioned Hot is actually easier to chew between the three. Overall, I don't really find much with this that puts it above average. As I eat this, I keep seeing this in the same ballpark with the other major brands of teriyaki jerky, with the exception that it seems to have more meat flavor. My recommended beer pairing for this, go with a more refreshing pale ale like the Firestone Double Barrel Ale, or the Anchor Steam.